The MacFarlanes are descended from Alwyn, Celtic Earl of Lennox whose younger son, Gilchrist received lands at Arrochar on the shores of Loch Long at the end of the 12th century. Robert the Bruce when forced to flee the Lochside and reach safety of the west Highlands was sheltered by Malduin, grandson of Gilchrist. The 20th chief, Walter Macfarlane who lived in Edinburgh for most of his life died in 1767 and the clan lands at Arrochar were sold off. The direct male line of the chiefs failed in 1886. Throughout this work we have endeavoured, as far as possible to avoid conjecture, but we are forced to it when we endeavour to deduce where the chiefs of McFarlane had their first home. Our conclusion is that this was a keep situated on what is now a wooded knoll, a prominent feature in the landscape, close to where the River Falloch enters Loch Lomond at the head of that loch. An examination of the spot reveals considerable appearance of a building having once stood there. The knoll is on a promontory which becomes an island when the Loch is high, and this opens up an interesting speculation upon the four islands which are mentioned in the charters, Island Vow, Vanow, Rou Glas Elaig. Island Vow and Rou Glas are well known, and what is now called Tarbet Island is probably the third, but where is the fourth? Ross Islands near Rowandennan are the nearest actual islands today, but these are a considerable distance from the reputed Arrochar country, so that we are driven to the conclusion that Tarbet Island and the promontory or Ardleish were Vanow and Elaig. Possibly the deepening of the river Leven at the southern end of Loch Lomond was accountable for the alteration of what we shall call Vanow from an island to a promontory. Assuming this to be the case, the first island stronghold of MacFarlane would be in a position relative to the mainland similar to Inveruglas. The known habit of the clan of building these castles on islands, provides further justification for our hypothesis. If this was deemed expedient from motives of prudence, in later times, it was the more necessary in the earlier days of Gilchrist and his don Duncan. Possibly when the castle on Island Rou Glas was subsequently built, the older residence became the home of the cadets of Ardleish, still the name of the adjoining farm. We are supported in the above views by the Revd W S Winchester who writes: “The ruins may still be seen on the wooded knoll which stands at the head of Loch Lomond and which is an island when the Loch is high”. We incline to the opinion that the castle of Inveruglas comes next in order of antiquity. We have historic confirmation that it was destroyed by Cromwell, but when built we have not been able to discover. The ruins still stand, and as they have remained undisturbed except for some quarrying, quickly stopped, we are glad to say, by the present owners of the Arrochar lands, the Colquhouns, we imagine that if a scheme of careful excavation of the interior was instituted, some interesting discoveries would be made. Our illustrations give an excellent idea of the present condition of the outer walls, but we have not reproduced our photograph of the interior as it simply represents a maze of tree trunks and branches amongst which nothing can be distinguished. Owing to the mass of stones and rubbish within, when one enters from the south through a breach in the wall, one finds oneself at the level of approximately the first floor. If all this was cleared out, possibly some remains of the ground floor apartments might be revealed. The barn on the mainland opposite the island castle is said to have been built of stones from the ruins. As will be seen from our illustration, two of these stones were rudely ornamented, and the builder thoughtfully gave them a prominent position on either side of the door. Probably more of such stones still lie buried amongst the ruins. The castle stood north-east and south-west, and had two keeps, one at either of these corners. We have searched for evidence of an entrance, and conclude that this was in the south-western tower. The entrance to Gartartan Castle is in that position, and the stronghold in Perthshire appears to have been built with Inveruglas as a model. Colour to this theory is lent by the fact that the little landing bay is at the most convenient point to this tower. If today, one attempts to take boat to Inveruglas, by borrowing the only craft available – that belonging to the shooting lodge and moored at the mouth of the river Uglas – one quickly discovers that that was not the way by which our ancestors reached the island, for one is at once in difficulties on the gravely shallows. Nor did they embark from the edge of the bay to the north, probably because the ground would be boggy. Their point of departure was Portachuple (the cobbler port), a little distance to the south of the estuary. As we learn from the story of ‘Black Duncan’, in the time of John the laird, there was a mill at Portachuple, and the little harbour would be on the shore below. We were shown the spot by Campbell, Sir Ian Colquhoun’s gamekeeper in these parts. We found Campbell a most willing and intelligent guide, and take this opportunity of expressing our gratitude to him for his great assistance as boatman and general assistant during the two days we spent securing the photographs, which embellish these pages. Without his co-operation, the little enterprise would have failed, for otherwise we must have taken a small boat from Tarbet or Ardlui, distant respectively three and five miles. Parallel with the southern wall of the castle, and nearer the lake, are the remains of another building, doubtless used for auxiliary accommodation. Amongst the trees there is an ancient yew. We know that Robert the Bruce encouraged the planting of such trees to provide bow shafts and probably this ancient tree provided many a MacFarlane weapon. ‘The old castle’ at Arrochar was undoubtedly built much earlier than some writers are disposed to allow. Their confusion is excusable, for the authorities from whom they derived their information, were careless in their descriptions of locations. When one reads: “In the reign of James VI MacFarlane’s dwelling house was at Tarbet”, it is natural to assume that this house was on Loch Lomond, but when we turn to Douglas, and read: “Chief Seats – at New Tarbet, on the banks of Loch Long; Elenvow and castle of Inverouglas, both islands in Loch Lomond; all in the shire of Dumbarton”, the castle at Tarbet vanishes into thin air. George Eyre Todd writes: “The main stronghold was the castle of Arrochar, nothing of which now remains but a fragment of wall. 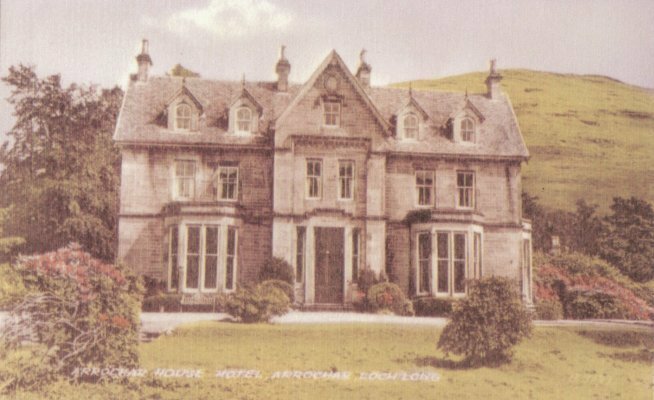 The later Arrochar house, by which it was replaced, is still to be seen embedded in the modern mansion of the name on the shore of Loch Long”. Mr Eyre Todd is wrong in only one particular. If the reader will refer to our illustration, showing the side elevation of the mansion, they will at once observe that there are three distinct sections. The rearmost section still containing, in one instance, rungs protecting the apertures, is without doubt a portion of the “old castle”, while the middle section is the portion remaining of the house built by John, chief in 1697. The fragment of wall referred to by Mr Eyre Todd is some little distance apart to the right rear of the back of the house, and to our mind is the remains of the keep which was still standing when the estates were sold in 1784, as stated in the account of McPharick’s prophecy given under William, the chief. If further proof of the existence of a castle at Arrochar prior to 1697 is required, we have it in two statements which should be read together. The first is from the historical narrative in regard to the invasion of the Arrochar country by Cromwell’s troops. It is there stated that MacFarlane was twice besieged in his own house and that his castle of Inveruglas was burned. The second is from Irving. “After the destruction of Inveruglas castle, the chief fixed his residence partly at Tarbet (New Tarbet on Loch Long), and partly on a small island in the northern part of Loch Lomond (the castle of Eilean Vhow was built in 1577)”. It was towards the close of the seventeenth century, in 1697, when times had become more peaceful, and it was no longer necessary to seek security behind strong walls and ramparts, or on islands separated from the mainland by the deep waters of Loch Lomond, that the second Arrochar house was built incorporating the south-west portion of “the old castle”. This was the work of John the 19th chief. In our sketch illustrations we have endeavoured to reproduce the appearance of each of the two houses. It would seem that the chiefs, at all periods, until John departed there from, were highly conservative in their ideas of castle designing, for all four, Inveruglas, Arrochar, Eilean Vhow and Gartartan, bear a striking family resemblance to one another. Each had two keeps placed at opposite angles, and these towers, in each instance, faced as nearly as possible, north-east and south-west. The castles, besides, are almost identical in size, seemingly built from the same plans. “This stone was taken from the main entrance of the house built by John, Chief of the MacFarlanes, and Laird of Arrochar, in the year inscribed upon it”. That there was a house of sorts at Tarbet we do not doubt. According to the Revd Mr Winchester, this was situated close to where the school house now stands. He describes it as not much better than a shepherd’s house of the present day – 36 feet long and 14 feet broad – a room, kitchen and closet. The kitchen fireplace was in the middle of the floor; the front window had four small panes of glass, while the back window was of rungs with wooden doors. The front window of the room had six panes of glass, and its back window was similar to the kitchen back window. But Mr Winchester falls into the popular error in regard to MacFarlane’s dwelling house being at Tarbet. Considering that at the same period, Walter, chief, the hero of Langside, built himself the handsome castle on Eilean Vhow, we may be pardoned for disbelieving that he was content to occupy a cottar’s hut at Tarbet. This was probably the house MacFarlane and MacFarlane of Gartartan sat drinking ale in their house (the house of which? ), when the Colquhouns came to attempt to recover the gates of Rossdhu. Walter, the brother of Andrew, the 12th chief, is variously styled as of Ardleish and Tarbet. He was the progenitor of the Gartartan MacFarlanes, and as this branch were tacksmen of what is now the Stuckgown estate, there is little doubt in our minds that the house, above described, was the residence attached to this property. In remote times, we are not gainsaying, there ma have been a castle at Tarbet, but certainly not as recently as the reign of James VI. Mrs MacFarlane Little mentions that just below the Free Kirk Manse at Tarbet, near the water’s edge, stood the chief’s house, before the old castle was built at Arrochar, and we are also told that ‘Tom-na-hianish’, the ‘hill of witness’, and ‘Tom-na-Croich’, the ‘gallows hill’, were within view of the chief’s house. As the dispensing of justice by the chief was a very ancient institution, there may have been a castle at Tarbet contemporary with the institution of the ‘hill of witness’, but that would be in the period of Ardleish and the founding of the clan. The avenue or path leading to ‘the old castle’ at New Tarbet, can still be traced through the existing grounds, across the road which comes out in Loch Long at Tighness, and in the field beyond. In one of our illustrations, the Editor is seen standing on a small bridge, in the midst of this field, which carried the road to the castle of New Tarbet. A final word upon the confusion of name; if the reader turns to the chapter on William where is given the ‘Memorial and Abstract of Process of Sale of MacFarlane of MacFarlane’s estates’, he will see that these are collectively described as ‘the lands and Barony of Arrochar’, while specific reference is made to the ‘mansion house of New Tarbet’. The castle on Eilean-a-Vhow, on the authority of Nisbet, was built by Andrew, the hero of Langside, the 14th chief, in 1577. It was here that he entertained the king he had served so well, as already recorded. The stronghold is described as a very substantial and, for that time, even elegant castle. The ruins still stand, and are in a better state of preservation than those of Inveruglas, not having suffered the same punishment, and the building being, of course, more recent. Our interior view gives an excellent idea of their present state. The north-eastern tower is gone, but a substantial portion of the opposite keeps remains. The opening, against the angle of the wall, to the left of the picture, leads into a chamber which is quite intact and although, owing to the accumulated rubbish, one has to descend into this apartment, our impression is that it was really on the ground floor of the castle and was probably a guard room. The island has gone by different names at different times. Originally Island Vow in the charters, for a period it was known as ‘Eilan-ure’, ‘the new island’. This second description was probably given when Walter built his new house upon it, and distinguished the house, probably more than the island, from the existing castles of Inveruglas and New Tarbet (Arrochar). Later, when the chief had abandoned the island castle as a residence, it became known as ‘Eilan-a-bhuth’ – ‘the island of the shop or store’. This was due to a very ordinary circumstance. A certain Andrew MacFarlane, it is recorded, used the kitchen (what we have called a guard room) of the old castle as a sort of store in which he kept the goods which he sold to the inhabitants on both sides of the loch. Some removal of the stones of the castle also occurred in regard to Island Vow, but in this instance, also, Sir James Colquhoun exercised his veto upon such vandalism. Here, as in the case of Inveruglas, research promises to repay. On one occasion, a tree on the island was blown down, and in the upturned earth, amongst the roots, was found a rusty sword which is in the possession of a present time MacFarlane living in Arrochar. Daffodils still blossom every spring beside the ruins where the garden of the stronghold once lay. The scene of two legends of the clan are laid around this castle. One day some McGregors came over from Graigroyston to Elilean a Bhogda (Island Vow), probably with intent to raid the garden or hen roost. These were a party of men who ‘lifted’ from all and sundry, as opportunity offered. As all the MacFarlane fighting men were away on an expedition, the marauders counted upon the chief also being from home. But he was in his castle, although only his daughter and some women were with him. Seeing the boat approaching he guessed mischief was afoot, and determined, if possible, to circumvent the MacGregors. Accordingly he crawled out along the rocks at the south end of the island, at the furthest point for which the boat was making, and slipped quietly into the water. Concealing himself behind a large rock, he lay with only his head above water; a big boulder ready in his hands. As the boat drew near, judging the distance well, he rose up out of the water, and with a might ‘putt’, threw the boulder into the boat. It staved her in and she sank. Seeing the MacGregors struggling in the water, MacFarlane’s daughter and the other women picked off the swimmers with arrows, a sport in which MacFarlane himself joined, as soon as he came to land, but the number of their victims is unrecorded. It was during the time of the chief of the MacFarlanes lived in their stronghold, the ruins of which can still be seen on ‘Eilean a Bhuth’ – the island of the store. The wife of the chief was a delicate woman, and she was not in a fit state to nurse their infant son. Now there lived in the wild region between Glenloin and Garestuck an uruisg and his wife, and MacFarlane, thinking that the uruisg’s wife would make a good nurse for his son, waylaid her and carried her away to his castle. The uruisg resented this forcible abduction of his wife and brooded revenge. So he watched among the stones and bushes on the hill side till he saw the chief’s dairymaid come to the mainland to milk the cows, when out he sprang from his hiding place, seized the bewildered maid, tore off her breasts with his teeth, and allowed her to return thus mutilated to the island. MacFarlane was furious; he immediately set out in pursuit of the uruisg, caught him and hanged him on a thorn tree which grew on the ‘Rudha Ban’, in full view of his wife, who, he imagined, would thus be frightened into submission, and be reconciled to her lot. But the uruisg’s wife proved as intractable as her husband. She was not reconciled, and very soon afterwards she was found attempting to poison the chief’s infant son by applying a hemlock poultice to his feet. Tradition does not relate her end, but it can be imagined. This legend, which is perhaps the most widespread and persistent of all the local lore, connects itself in a curious way with the crest of the MacFarlane family – the crest of a naked man holding a sheaf of arrows and pointing to a crown. Clan historians tell us that the naked figure stands for the infant son of Queen Mary. But the figure is a naked man, not a naked infant; and the local explanation of its present in the crest is that it stands for the ‘uruisg’ – the savage man, the last of the wild men of the hills, who was hanged on the ‘Rudha Ban’ when the MacFarlane chiefs lived in ‘Eilean a Bhuth’. “It is not possible,” speculates the Revd W S Winchester, “that the tale embodies grotesque and distorted traces, yet true traces, of some aboriginal race – spoken of elsewhere in the neighbourhood as the ‘wee picts’ – which lingered on until comparatively recent times in the wild recesses of the hills”. Attractive as is this explanation of the demi-savage in the crest, we must dismiss it in view of the fact that the incident recorded must have occurred sometime after the battle of Langside, when the crest was bestowed. The castle on Eilean Vhow was not built until years after that battle. For ourselves we have no difficulty in believing that the figure of this demi-savage is intended simply to signify that the high courage displayed by MacFarlane was equal to that attributed to primitive mankind. Gartartan Castle, or Gartavartan, as is it sometimes named, stands about half a mile back on the right bank of the River Forth and a similar distance below the bridge over the river, near Gartmore railway station. It is within the policies of Gartmore House, now in the possession of the Cayzer family. Entirely covered with ivy, the ruins present a most picturesque appearance. As we have remarked, although we did not measure them, Gartartan seems to be an exact model of Inveruglas. It is in a very much better state of preservation; the south-west tower and the first floor with the stairs leading to it, are practically intact as well as a portion of the stairs to the next floor in the opposite tower. 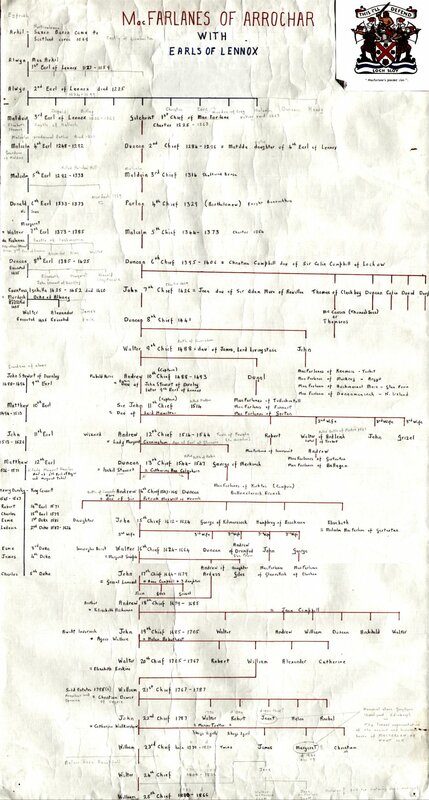 Source of this document unknown it was found with papers left by the late Norrie Douglas. earliest of the clans to hold their lands by feudal charter. In short, the MacFarlanes are descended from Alwyn, Celtic Earl of Lennox, whose younger son, Gilchrist, received lands at Arrochar on the shores of Loch Long at the end of the 12th century. Gilchrist's son, Malduin, befriended and aided Robert the Bruce during his fight for independence from the English. The MacFarlanes are reported to have fought at Bannockburn in 1314. The clan takes its name from Malduin's son Parlan. The name, Parlan, has been linked to Partholon, " Spirit of the Sea Waves", in Irish myths and legend. More usually, it is considered the Gaelic equivalent of Bartholomew. Gaelic grammar requires changes within a word to indicate possession. A "P" is softened to a "Ph", and an "i" is added to the last syllable. In this way, " son of Parlan" becomes Mac (son) Pharlain (of Parlan). From an article written by Kent MacFarlane for The Lantern an explanation is offered to the derivation of present spellings of the MacFarlane/McFarland name. “As has been written many times before. The proper, i.e. Gaelic, spelling of the name is Mac Phàrlaine. The correct translation of the name into English is Macfarlane. All the other variants are scribal "errors" caused by people writing down what they heard. One of the maligned versions (maligned for being "Irish" -as though that makes it suspect or "wrong") is MacFarland. According to documents found in the Procurator's Library in Glasgow, the name "Makfarland" occurs for the first time in 1543 in a Charter of Confirmation* from Matthew, Duke of Lennox to "Duncanus Makfarland de Arrochquhar" -the 13th Chief of the name. The Rev. Mr. Macfarlane goes on to say that the last instance in this time-frame was in 1596, in a document* concerning "Umfrido Makfarland", who was the younger son of Andrew, the 14th Chief. He also mentions that there were other variations in use in other documents. The Rev. Mr. Macfarlane points out then that the Plantation of Ulster began in 1608. It is well known that many Macfarlanes left Scotland at this time to take advantage of the lands available in Ulster. He says: "Therefore it seems that the Irish "M'Farlands" have the credit of handing down to us the spelling that was IN VOGUE AT THE TIME OF THE PLANTATIONS." (emphasis added - K.M.) The Rev. Mr. Macfarlane shows also that another variant, Macfarlan, was common on both sides of the Irish Sea at this time. Among other things, that the "-an" form continued in Scotland but disappeared in Ireland, while the "-and" form continued in Ireland, but disappeared in Scotland. From the publication, History of Clan MacFarlane, written in 1922 by James MacFarlane of Scotland, more of the Clan heritage is described chief by chief. Some of this information was provided in Lola’s manuscript; however, what follows differs in the end. In the early years of Scottish history the MacFarlane clan’s fortunes were tied to those of the Earls of Lennox, even when the blood relationship ended. When the direct line of heirs to the Earl’s title died out, the MacFarlanes lost their bid to be recognized in that position to John Stewart of Darnley who prevailed at the 9th Earl of Lennox in 1488. Although the MacFarlanes could have lost everything, a marriage union saved the day, lands and charter were returned to the MacFarlane chief and the MacFarlanes went on to support the Earl’s line through thick and thin. On Henry VIII’s death in 1547, many Scots saw an opportunity to recognize their 5 year old Queen Mary as the legitimate heir to the throne of England as well as Scotland. Duncan, the 13th chief, lost his life at the Battle of Pinkie when the forces of Henry’s son, Edward VI, invaded Scotland and defeated this effort. Andrew was Chief from 1547, when he was only three, until 1612. These years were filled with violence and vendettas, feuds and thievery. 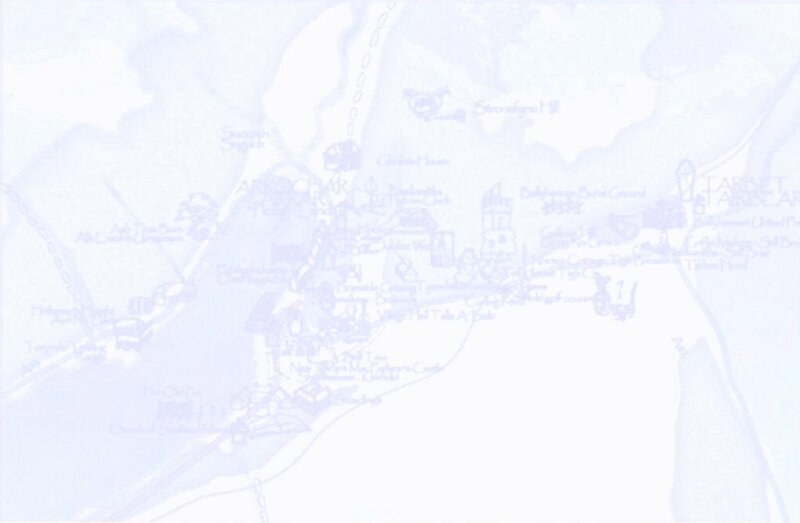 The most famous story is the feud between the MacFarlanes and the Colquhouns who lived in the lowland area of Luss. Competition seems to have turned murderous with the death of Humphrey MacFarlane at the hands of Sir Humphrey Colquhoun. What ever provoked this is unknown, but it led to a series of cattle-rustling raids in 1590. Then a story emerges of a love affair between the wife of John MacFarlane (heir to the chieftanship) and Sir Humphrey Colquhoun. John, with help from the MacGregors, followed the couple, chased Sir Humphrey to his stronghold, set it on fire, killed him and then mutilated his body. The story continues with his body parts being served on a platter to his unfaithful wife, followed by their divorce. Whether this is a fanciful tale or not, it is still the official excuse for his death. The raids continued, this time the MacFarlanes were helping the MacGregors against the Culquhouns. It seems the Culquhouns were more knowledgeable of courts and public relations, because their complaints against the MacGregors and MacFarlanes were more kindly favored by authorities. The MacGregors were proscribed and the MacFarlanes were outlawed in 1608. The son of Andrew, John, became the 15th Chief in 1612. Besides his first wife, a Buchanan, he was married three more times. His second wife was the daughter of Francis, Earl of Bothwell (Lady Helen Stewart.) The feuds and fighting continued and many of the clan were convicted of theft and robbery and removed to other territory in Scotland. If it wasn’t internal fighting with other clans, there was always some cause dealing with England that would give an excuse to raise the battle cry “Loch Sloy.” The English Civil War led to the execution of Charles I in 1649. Many in Scotland were supporters of Charles and the Cavaliers. In 1679, MacFarlanes fought for the Duke of Monmouth, Charles II’s illegitimate son, in his bid for the throne at the Battle of Bothwell Bridge. It was, however, unsuccessful. John was succeeded by his brother Andrew, in 1679. Then followed Andrew’s son, John in 1685 as the 19th Chief. He sided with the takeover of the English throne by William & Mary, Protestants, as opposed to the Catholic James II who was deposed. John was appointed Colonel of a regiment of footsoldiers in 1689 and seems to be the last of the chiefs engaged in war. 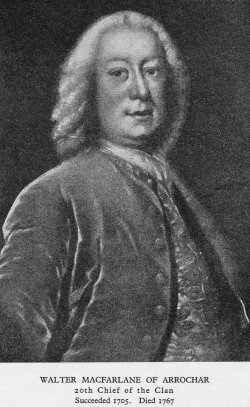 The 20th Chief was Walter MacFarlane from 1705 till 1767. He was known as a great scholar and antiquarian who devoted his life to collecting, translating, and preserving manuscripts of Scotland’s past. It is certain he did not lead any MacFarlanes into the battles fought in 1715 and 1745 to seat the Stuart pretenders in exile in France on the throne in England. There are conflicting reports as to MacFarlane participation in those fruitless adventures, however, since the MacFarlanes were Presbyterians, it seems unlikely that they would have switched allegiances to the Catholic Jacobites. Walter died without children in 1767, so the next chief was his brother William MacFarlane. William was the last landed chief. Like his brother, William was a learned man-a physician who practiced in Edinburgh. By numbers, the MacFarlanes still dominated the Arrochar area, but there was now little connection with their absent Chief. England, tired of the Highland clans foolish support of the Jacobites, outlawed some of the beloved traditions, such as wearing the tartan kilts. The power to hold feudal clan courts was also abolished and the Scottish Enlightenment had begun, producing many clever Scots such as philosopher David Hume and economic theorist Adam Smith. As taxes increased to pay for the American war, William, whose lifestyle was luxurious, and his gambling habits expensive, began to sell off his estates. First, his inheritance in Jamaica was sold, and then finally in 1784 the Barony of Arrochar. When William died in 1787, his son John became the first of the landless lords and the 22nd Chief—but of what? After him, the line slowly fades away, because even if there were descendants, they did not carry out the duties of chief and they had lost their connection to the ancient land. The last Chief was William, the 25th Chief from 1830 to 1866. A new era had dawned, making the MacFarlane clan, as a formal institution, a part of the romantic past. 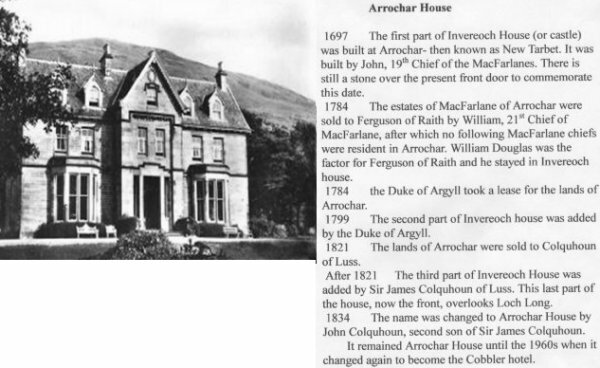 See also The History Of Arrochar House and The Arrochar Cemetery - with all the names and pictures of the grave stones.